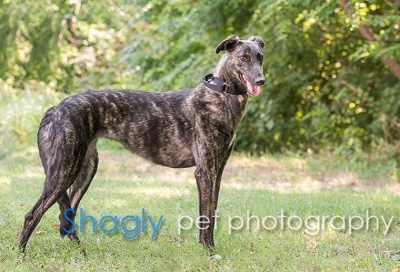 Leona is an approximately 2 year old black/brindle female greyhound found as a stray and turned over to GALT by her rescuer. Her medical testing shows she is heavily infested with intestinal parasites, but thankfully heartworm negative. Leona is very outgoing and friendly – a real social girl with a striking curly tail! Leona is not cat or small animal tolerant at this time. 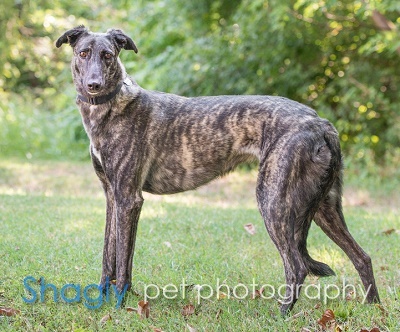 Leona is a petite dark brindle girl with an adorable curled tail and a very soft coat. She LOVES people and enjoys snuggling. Belly rubs are a must. She loves to play tug of war with her foster pack mates. Stuffed toys are her fav. She loves to run zoomies in the backyard whether alone or with another dog. She loves the doggie wading pool and if it’s not available, she sits in the water bowl! She uses the dog door with ease, sleeps thru the night and has never had an accident in the house. When napping, Leona does on occasion “sing the song of her people” in her sleep. She is very smart and a quick learner. Her prey drive is quite high so Leona cannot live with cats or small animals of any variety. She would probably do great in agility training or barn hunts! Leona is a lot of greyhound packed into a small package. If you’re looking for a loving and peppy little socialite, Leona is the one for you!